Where is this person? I'd like to know. I've already mentioned how I struggle with winter, and this year it seems like my mental toughness/motivation is suffering as well. 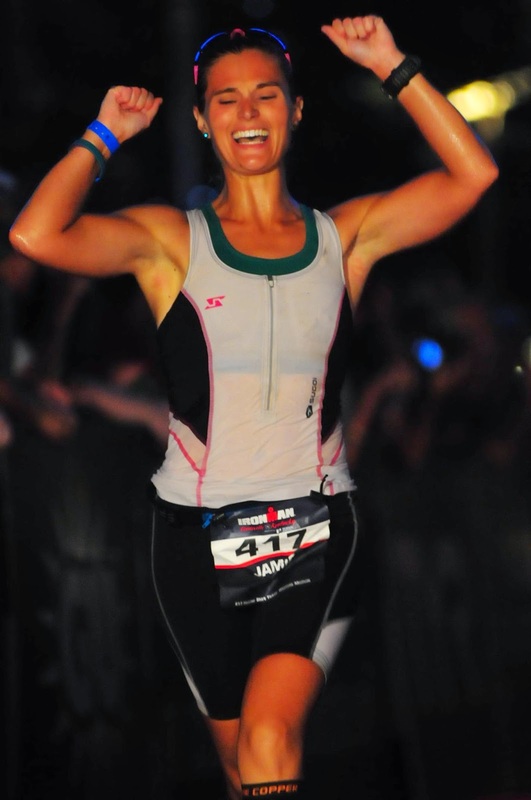 I don't even feel like that person who completed an Ironman or even the person who ran a sub-4 hour marathon. I know I was the person who did those things, but I'm wondering if I still am that person. I find myself questioning if I am still capable of running a fast marathon time, or if I am going to be able to complete my 50K in May, or if I am going to be able to finish another Ironman. 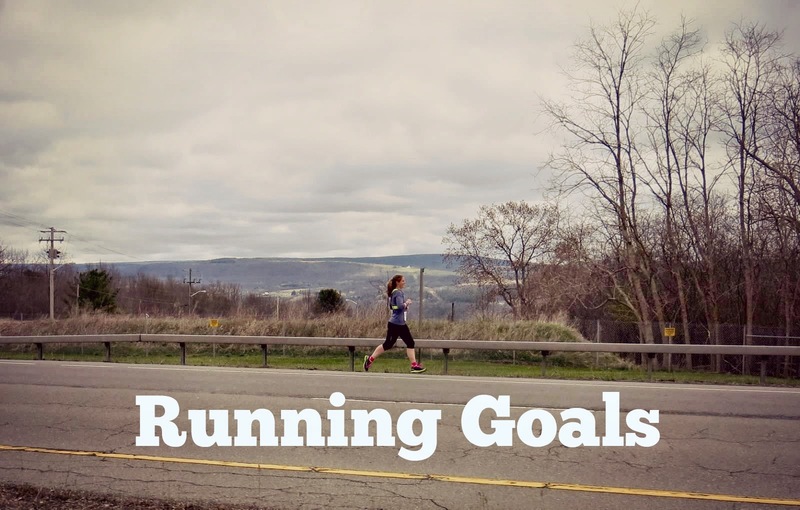 Deep down inside, I know that I am capable of doing all of those things, and more (I'm even contemplating a 50 miler in November). But for some reason, my mental toughness is severely lacking right now. I put off running until tomorrow and rode on the trainer tonight instead. At least I did something, I could just be skipping workouts completely. I could have gone for a run, Mike and I were planning on it, but then I got home and I just let my mind get the best of me. It wasn't even that bad outside, alright fine it was 18 degrees and wherever we ended up running would have been snow-covered but at least the sun was shining. 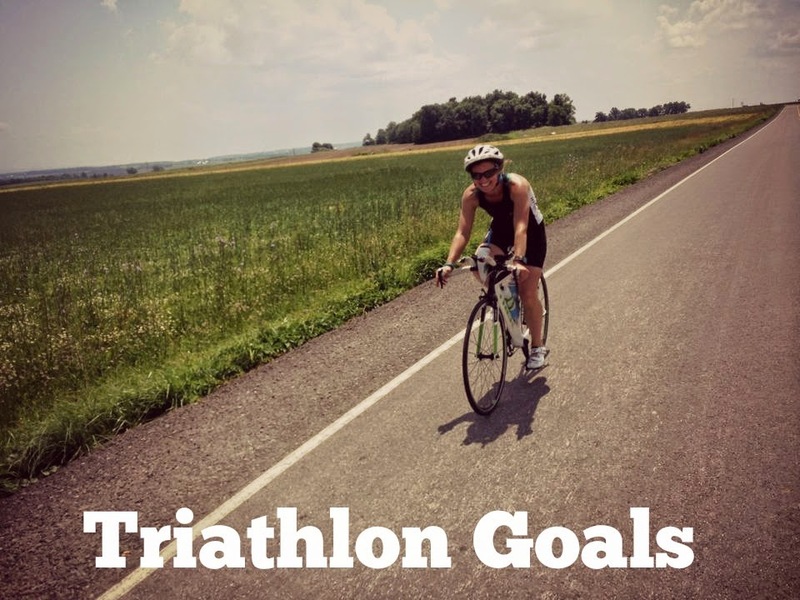 Part of my lack of motivation (even though I am getting all of my run workouts, at least one swim and bike workout and two strength workouts done) is the fact that we don't have any races until March 29th. It just seems so far away and makes winter feel like it is never-ending. The good news? 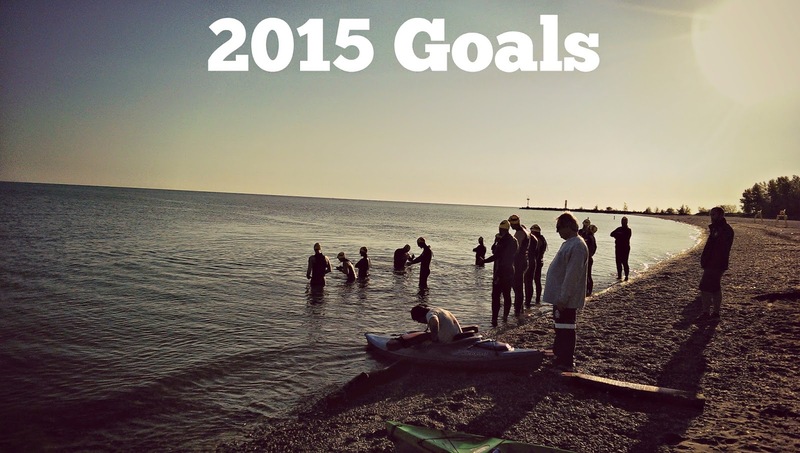 I still LOVE swimming, biking and running. It is still who I am. I know that this sport, just like life, comes with ups, downs, plateaus and everything in between. My 50K training starts tomorrow. Technically, tomorrow is an off day (good thing since I accidentally haven't had an off day since last Sunday), so training starts Tuesday. I also go back to work tomorrow, with a few vacation days over the next two weeks, so it's really time to get back into the groove. I figured that even though I wasn't officially training for Pineland yet, that didn't mean I couldn't get in some "unofficial" training. My training plan is going to "only" be four run days a week, with two "long" runs on the weekend of varying distances. At the end of February, Mike and I will start 70.3 training which means that I will be training for both races simultaneously. It's not the preferred option, but it isn't something I haven't done before either. 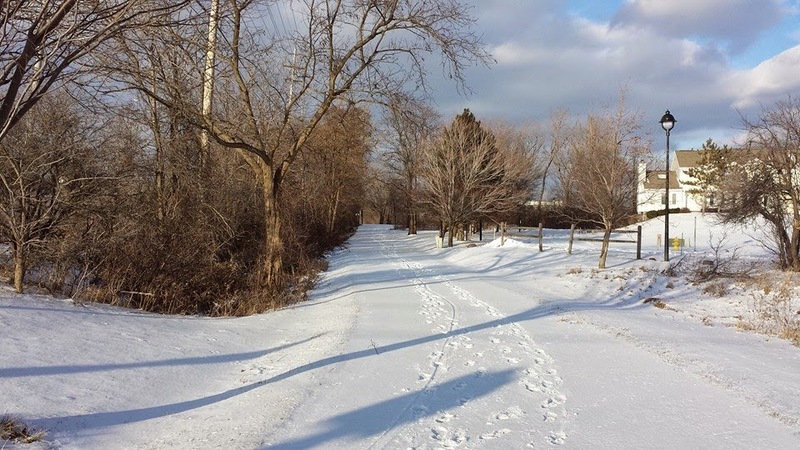 Yesterday, Mike and I braved the cold temperatures and ran a 10K along the canal path. 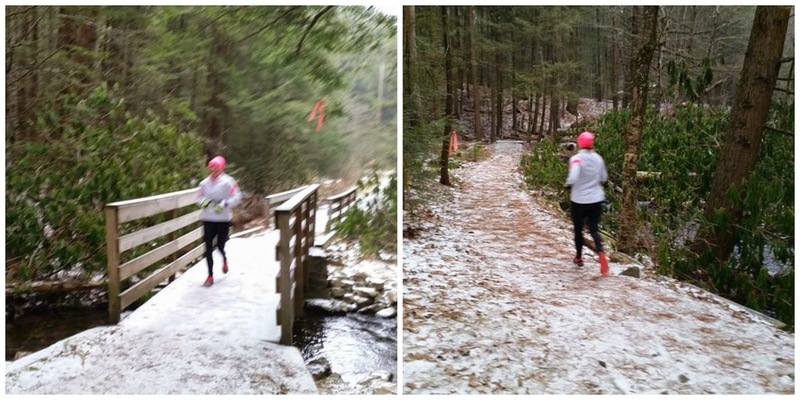 We wore trail shoes because we weren't sure how the conditions would be, in the end it was a good thing that we did! There was a bunch of snow on the path and the well traveled areas were harder to navigate through because of the tracks in the snow. 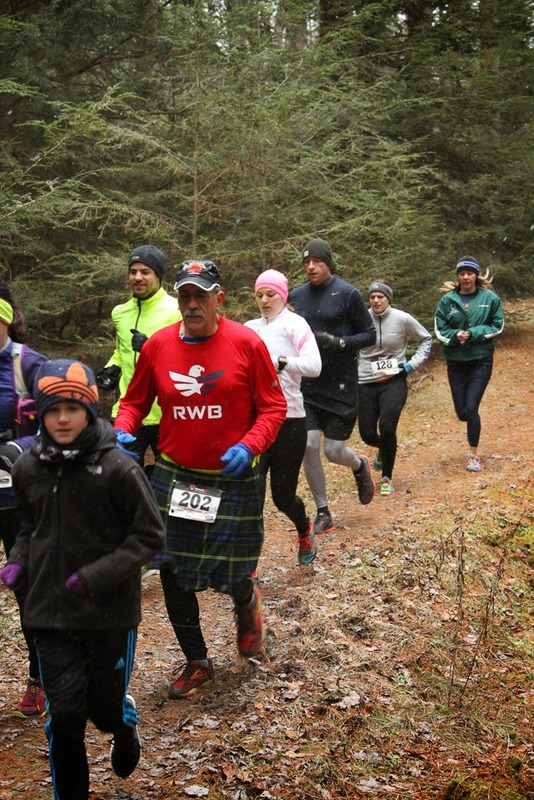 This morning, we met up with some old and new friends for a trail half marathon-ish run. 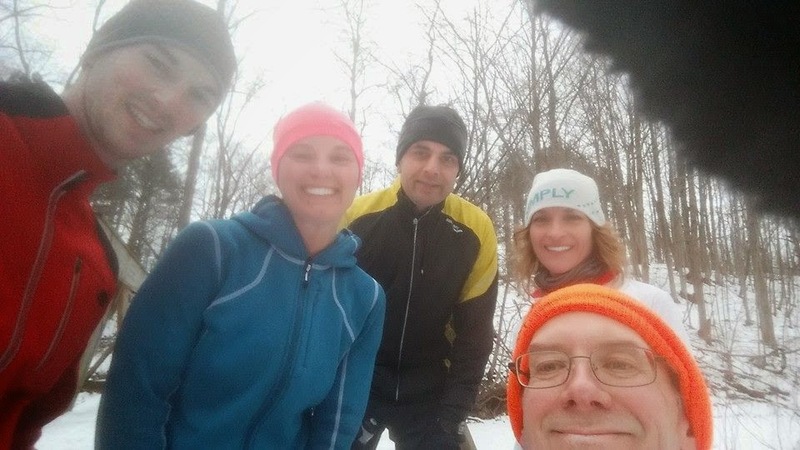 Our friend, Todd, and new friends, Prem and Michelle, joined us on the Seneca Trail. 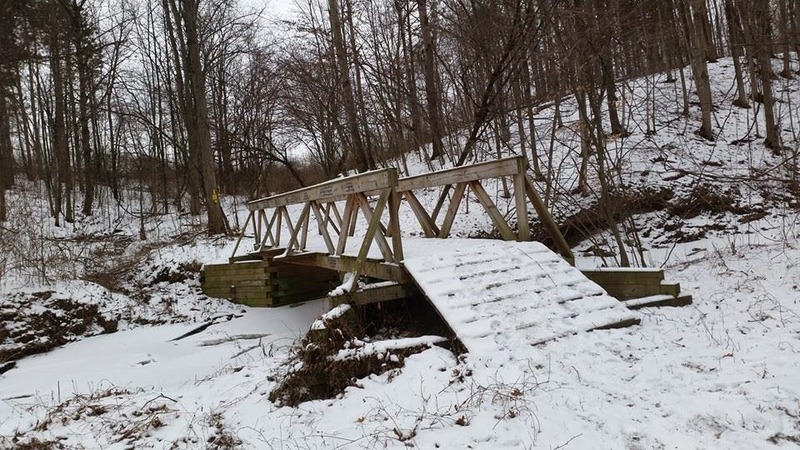 One of my goals this year is to run the entire length of the Seneca Trail (out and back) at one time. Before today, Mike and I hadn't run approximately 3.9 miles of the trail. I wanted to run the entire trail, at different times, before attempting to run the entire thing at once. 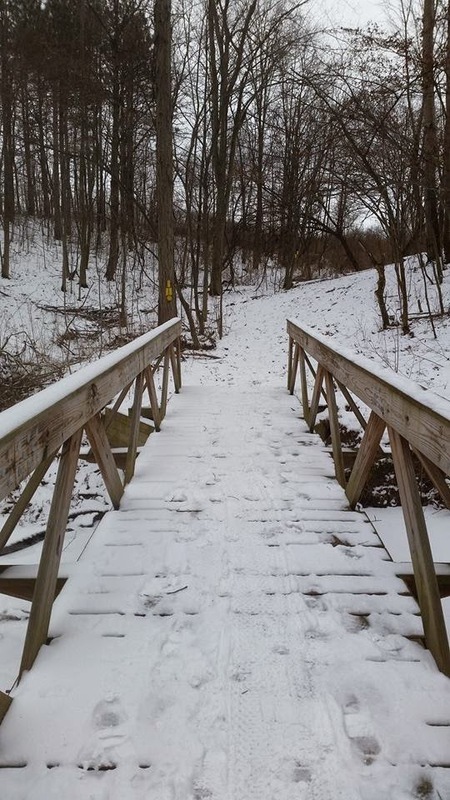 Even though the trails were snowy, the footing wasn't too bad (I didn't even wear spikes or extra traction). We took it relatively easy and it was an enjoyable run with even more enjoyable conversation. I had a lot of fun getting to know Prem and Michelle. Even though this trail has some challenging parts (definitely not as many as other trails in the area), I love it. 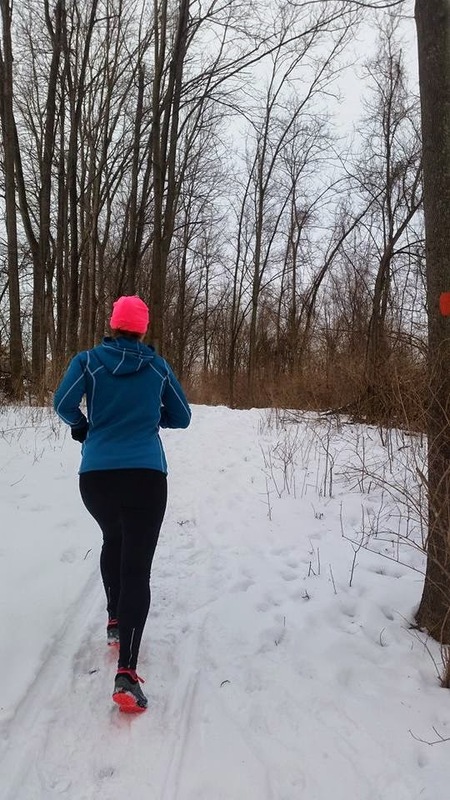 It is my favorite trail by far and I am excited to try to attempt to run the 28 miles in April. 50K training? I've got this! 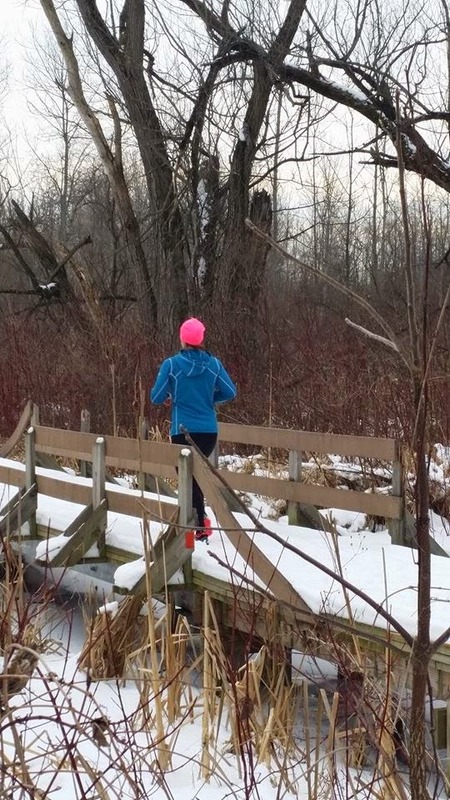 And I guess now it is time to say - let the 50K training begin! 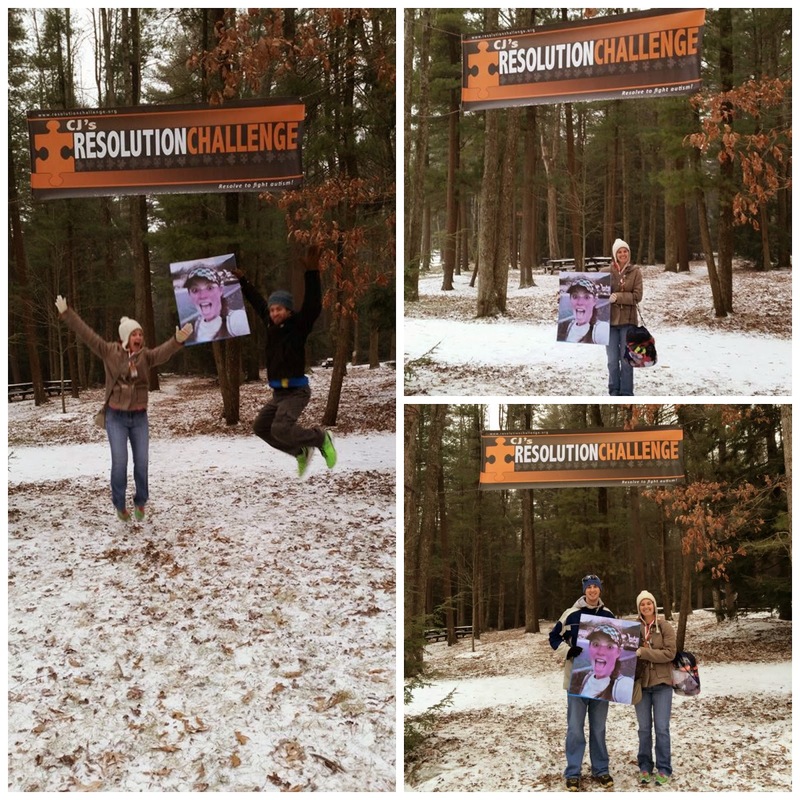 This past weekend, Mike and I went to Pennsylvania to run and help out at the second annual CJ's Resolution Challenge. Our friend, Janell, is the race director and she does an amazing job putting this entire event together. Her family and friends work really hard to make sure that everything is perfect for the runners and after last year's race, we knew we wanted to be a part of it again this year. Mike and I knew we would be going to the race, we just didn't know in what capacity. Mike eventually decided that he wasn't going to race and that he would just volunteer. Since I have my 50K in May this year, I figured that racing would be in my best interest. Our friend, Isaac, ended up registering as well! On Friday we dropped Bernie off at boarding and then made the 3ish hour drive to the race location. 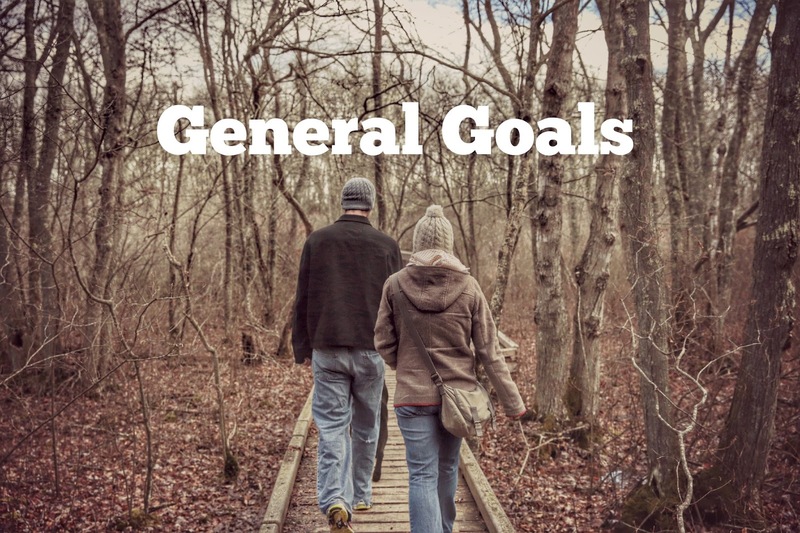 Janell, her husband, Aaron, and her family were already setting things up for the next day. When we got there, Isaac was already there and the four of us set out to make sure the course markings were in order (Mike found a few spots that needed more markings). Mike and Isaac ran the loop a few times. Mike got in a few more miles than Isaac, seeing how Isaac ran the Boston Marathon course the day before - in 3:15. I'm glad Mike was able to run since he wouldn't be racing the next day. A big selfie with Crystal! 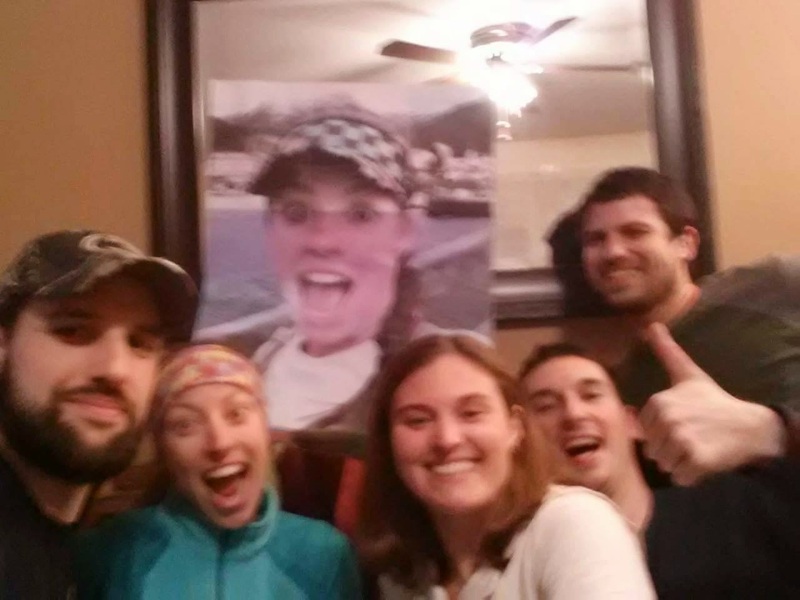 After everything was set at the race location, we all went back to Janell and Aaron's house to hang out. 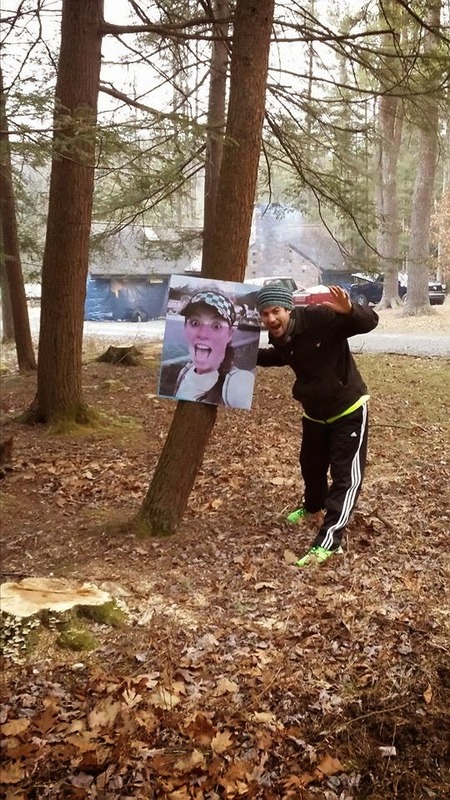 Isaac brought out his surprise that he had made for the race, a huge photo of Crystal! 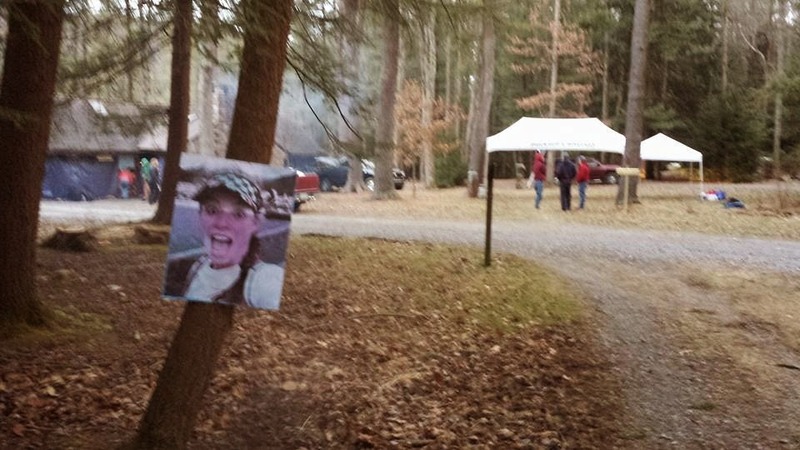 We knew we would need to take a selfie with her since she was sad that she wasn't going to be there for the race. Even though the race started at 9am the next morning, Isaac and I decided that we would go with Mike in the morning who needed to be there at 7am to start his volunteering duties. We all went to bed excited for the next day! After an early-ish wake-up, we got ready quickly and made the fifteen minute drive to the park. The race takes place in R.B. Winter State Park and it is a really nice location! I'd love to go there and explore more of the trails sometime. I wish the wind didn't knock this down, I was planning on high-fiving her every loop! When we got there, Mike started out his volunteering duties at the registration table. Janell asked me and Isaac if we wouldn't mind putting out the two sponsor signs out on the trail, and of course we didn't mind! We made the walk through the woods and the weather was still holding out. When we got back to the race start a few more runners had started to arrive. At that point, I started to get ready for the race. We still had about an hour until the start, so I took my time getting ready. Right before 9am, Janell made a few pre-race announcements and then we were off! Isaac and I weren't doing the same race format, but we were able to run the first loop together. I decided to do RC Revolutions, run as many loops in the 3 hour time frame as you can, and Isaac decided to do the Last Man Standing (what Mike did last year). Last Man Standing participants have a specific amount of time to finish each loop and as the race continues the time allowed decreases (for example, the first loop the runners have 20 minutes to finish, then 19, then 18, and so on). The loop is approximately 1.6 miles and is half trails and half paved road through the park. We took the first loop easy, since Isaac had 20 minutes to finish the loop, and we were closer to the back of the runners. We did pick up the pace once we hit the road portion and after jumping back on the trail to get back to the start/finish area Isaac and I said our goodbyes. I thought we may see each other again, at least briefly, during the race but we never did. I had forgotten to change my watch to manual lap, instead of auto-lap, so I was unable to see my pace for each loop. Oh well! According to Isaac's watch, we ran the first loop (1.6 miles) at 9:40 pace, not bad for being stuck in the back and taking it easy. I used the same race strategy that I did last year, I would run two loops (approximately 3.2 miles) without stopping. 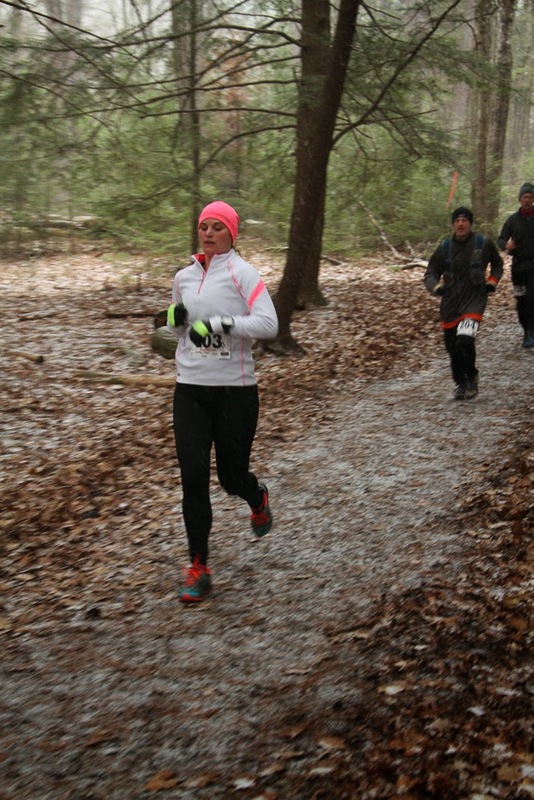 After two loops, I would stop at the aid station and drink some water (before my last loop I only took in Gatorade). Then I would walk, less than a tenth of a mile, while eating my energy chews. This worked out really well for me both years, and I think I will do something similar for my 50K. Since Mike and I haven't been running as much lately, I wasn't sure how many miles/loops that I wanted to do. 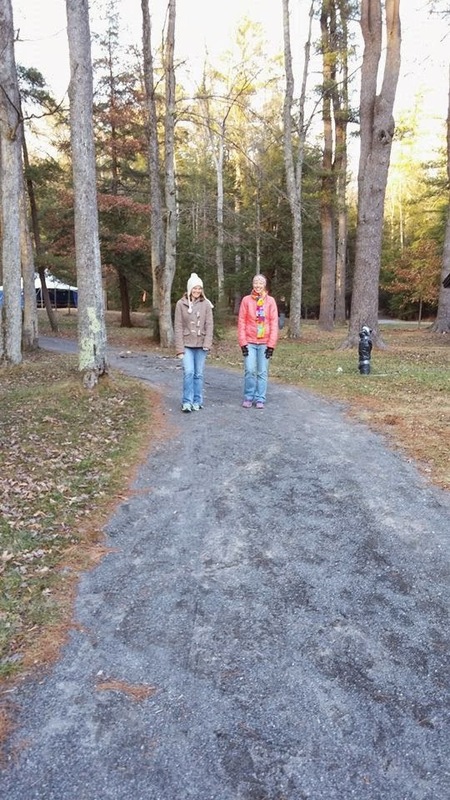 The longest we had run since the Philly Marathon was 10 miles on trails (2 hours) and I didn't want to push it too much. 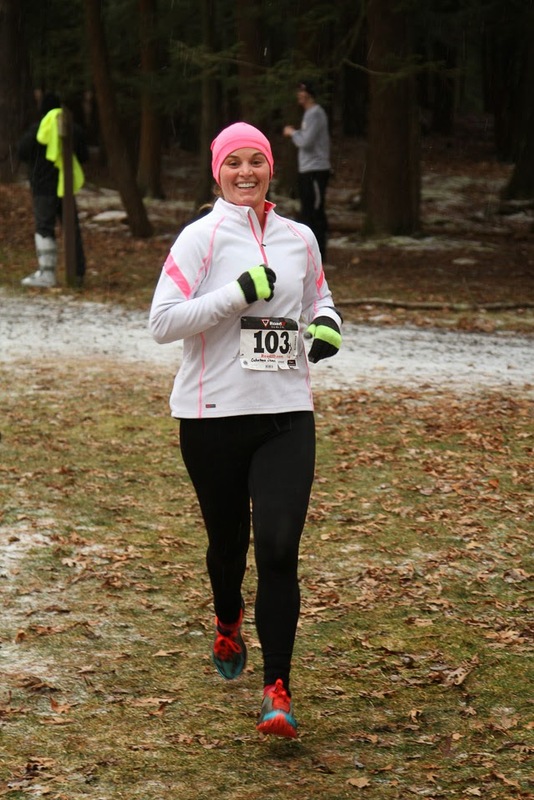 The weather was also predicted to deteriorate as the race went on (and right as the race started, it started to snow) and I knew that if it became too slippery that I would stop. The first few loops were uneventful. 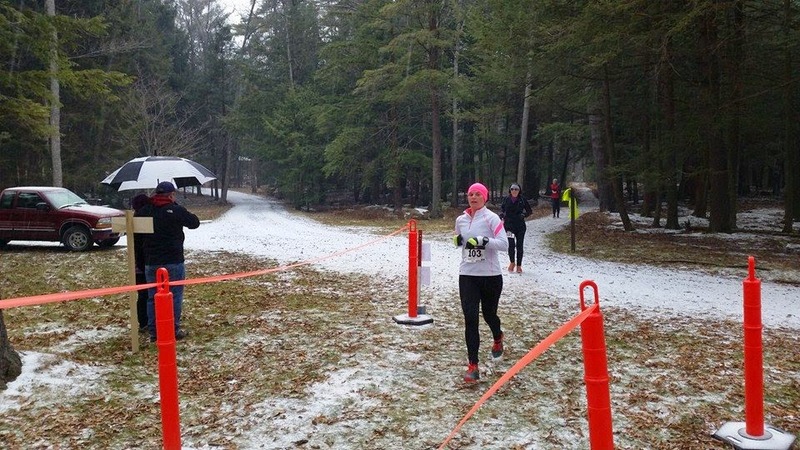 The terrain and footing were a lot better than last year since there wasn't any snow on the ground, so I was able to run the entire loop (except when I ate my energy chews). Right when I finished my third loop, Mike (who was now manning the RC Revolution check-in for the women) made a big deal about me coming in. I later learned that he had "missed" me during the first few loops. At first I thought this meant that he didn't mark me coming in (even though I heard people yelling out my number), but he just meant that he hadn't seen me run by him. After that, he would always make a big deal when I ran by the start/finish area. About an hour in to the race, it started to "rain" ice pellets. Combined with the wind, this made for less than desirable conditions. I just kept chugging along, though, and we did get a little bit of a break from the ice before it started up again. I told Crystal the day before that I thought I wanted to get 15 miles, but then I realized that wasn't possible with how the loops worked out. I would either need to do 9 loops (approximately 14.4 miles) or 10 loops (approximately 16 miles). Last year I had run 10 loops, so I decided I would go for that amount as long as I felt good. 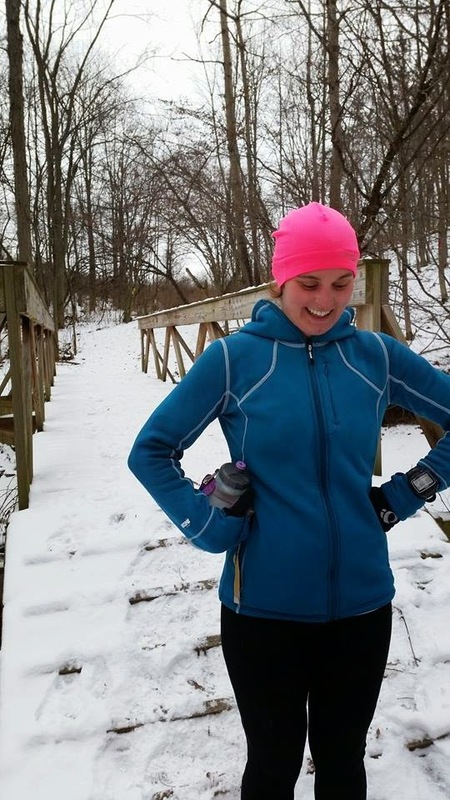 I was amazed at how good I felt, considering the lack of miles we put in during December. I knew that I couldn't push it, but I decided that I would try for one more loop than last year when I saw how much time I would have left if I stopped at 10 loops. At that point, I had 5 more loops to go. One of the last times that I stopped at the aid station, I did say, "I don't know how many more of these I want to do". The ice pellets were getting worse, and as a result, the paved road portion was getting tougher to run on. I just kept on going and even though I slowed down a little bit, I didn't slow down a lot. I made it back after my 10th loop and I told Mike, "just one more!" and after some Gatorade, I hit the trail one more time. I still hadn't seen Isaac, but I knew that the Last Man Standing people would be starting soon since I heard the two minute warning air horn. Pretty soon after that, the six people who had made that loop (not Isaac) ran blazing by me! They were crazy! I started talking with a woman running near me and she said that she was on her 11th loop too. She said she was going to go for 12 and I told her I was done after the 11th loop. As I neared the end of the paved road section, I saw Isaac walking toward me. As I approached him, he started running with me. I told him I was done after this loop, and he said that I wouldn't have time for another loop anyway (there was some confusion between the two of us on when you could start/finish your final loop, it turned out you just had to START your final loop before the 3 hours were up). 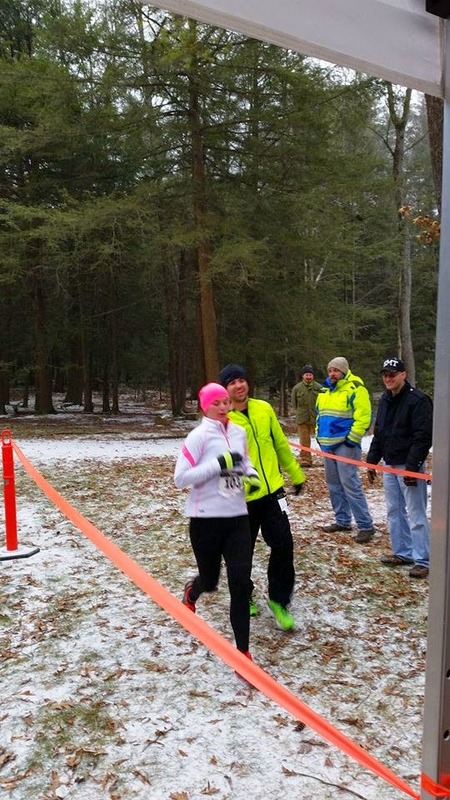 After crossing the finish line and getting my medal, I was so happy to be done! 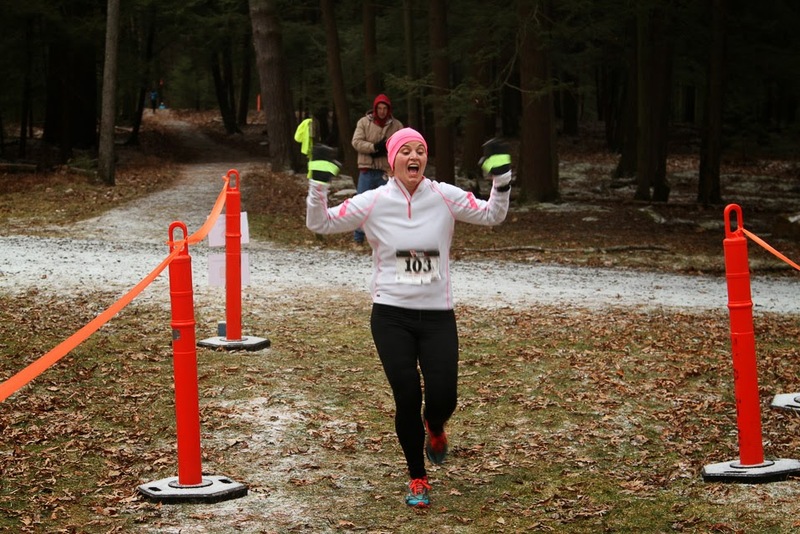 I did realize that if I had done a 12th loop, and stayed in front of the woman I had been talking to, that I would have come in 3rd overall for the women in RC Revolutions. That would have put me at 19.2ish miles, so it is probably a good thing that I just stopped at 11 loops. I finished 11 loops in 2:54:33 and got in 17.56 miles (according to my watch), which wasn't a bad way to start the new year! After changing clothes, eating some soup and trying to warm up, we helped break down some of the race stuff and then went back to Janell and Aaron's to take showers. This race is a great way to start the year and I hope that we are able to be a part of it, in some fashion, every year that it takes place. Janell does an amazing job and makes sure that everyone is happy at the end of the race. The love and care put into this event is obvious, and the fact that it benefits an amazing cause (autism research and awareness) is just a bonus.